Guided Games, Destiny 2's new solution for matching up solo players with teams for high-level challenges, is now live. Live in beta, anyway. Bungie flipped the switch on Tuesday, allocating a portion of its player base the Guided Games Tickets needed to join participate as a Seeker. What the hell is a Seeker or a Guided Game Ticket or anything I just said? So glad you asked! 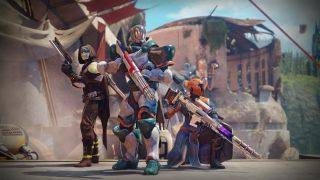 What are Destiny 2 Guided Games? In the original Destiny, it was a cherished tradition for veteran players to "sherpa" newer Guardians through tough challenges - sometimes as a favor to friends, sometimes to help out randos on a forum. Guided Games are like a codified version of that built around Destiny 2's clan system: they automatically hook up "Seekers" of high-end challenges like Nightfalls and Raids with "Guides" who are willing to show them the ropes. How do I join Destiny 2 Guided Games? That depends on whether you want to be a Seeker or a Guide. If you want to be a Seeker, you just hit the button in the Director and get ready to spend a Guided Game Ticket for the activity in question (more on those in a bit). If you want to be a Guide, you'll need to be in a fireteam with one clanmate for Nightfalls or two clanmates for Raids. In other words, at least half of your fireteam for the desired activity needs to be in the same clan before you can queue up as a Guide. Whether you're a Seeker or a Guide, you must meet all the usual level, power, and other entry requirements listed on the activity tooltip. How do I get Destiny 2 Guided Game Tickets? It's just luck at this point. Bungie gave Guided Games Tickets to a "percentage" of the Destiny 2 player base because it's only beta testing the system for now. The full rollout is planned for September 26, but that date could shift in response to what happens in the beta. If you're already in, you'll find a dozen tickets waiting for you at the Postmaster. Wait, so I can only do a limited number of Destiny 2 Guided Games? Short answer, yes; long answer, no. Folks in the beta only start with 12 tickets, and once they're gone, they can't queue up as Seekers any more. But first off, tickets are only required for Seekers, so Guides can queue up as often as they like. Second, everyone's baseline supply of tickets will be refreshed during 'seasonal resets'. No, I don't know how often 'seasonal resets' will occur. Third, it looks like you may be able to earn additional tickets by completing in-game activities; here's a player from the Destiny 2 beta in July getting a ticket as loot, for instance. It may be different in the full game, of course. What should I keep in mind for Destiny 2 Guided Games? Use your microphone! Not only is communication massively helpful for Destiny 2's high-end challenges, it's technically required for Guided Games (note the little microphone icon). And just as important, be nice! If you act like a jerk as a Seeker your Guides probably won't feel all that encouraged to help you. And if you act like a jerk as a Guide your Seeker will probably rate you poorly and lower your Oathkeeper Score, which will make it harder for you to participate in Guided Games in the future.